I know many of you cast members are glad that you work at Disney World and not Disney Land, and I am sure this NEVER happens here. Speaking of vandalism, there's been a growing list of incidents perpetrated on attractions at Disneyland that are not only illegal but that are increasingly, well... let's just say disturbing. The big problem isn't graffiti or hot-to-trot teens in a back row, it's park visitors smuggling in the cremated remains of their loved ones and then spreading the ashes inside a favorite attraction. The Haunted Mansion is by far the most popular location for this, but you'd be surprised where else people are dumping cremated remains at Disneyland. The craze seems to have gotten its start at the Haunted Mansion, with the earliest known incident taking place in the late 1990's. Ever since then the practice becomes more popular by the year, and it happens so frequently now that Disneyland has trained the ride operators how to handle such an incident and what to do when remains are discovered inside the attraction. Sometimes the person spreading the ashes is seen on the surveillance cameras and the Cast Members can respond quickly. Because they have been instructed by the Security and Legal departments to never actually detain a park visitor, most of the perpetrators spreading the ashes are never actually caught however, and they disappear into the park. But when a Haunted Mansion Cast Member sees ashes being spread from a passing Doom Buggy, the attraction is cycled out and shut down for hours at a time while the Custodial department comes in and begins the clean up. The Anaheim Police are also involved in the incident, but there's rarely anything they can do about it either. Sometimes however the cremated ashes aren't found until the end of the night when the Cast Members close down the rides and walk the tracks looking for lost and found. Just last month that situation occurred when a Cast Member at the Haunted Mansion found several piles and a trail of ashes alongside the ride track. The Anaheim Police and Disneyland Security were summoned, and judging by the large amount of ashes this deposit was likely a small group of deceased people, or perhaps a very large married couple. The police identified the substance as human remains, and the custodial crew came in for the clean up. To respond to this growing problem, Disneyland's custodial department recently had to purchase special vacuums with very sophisticated HEPA filters that can capture the gritty ash of human remains while also capturing the small bone fragments that can also be present after cremation. The Cast Members who work in Attractions know the code words when calling the custodial hotline, and they tell the custodial dispatcher that they need a "HEPA Cleanup" as soon as possible. While the rate of "HEPA Cleanups" has been increasing lately at the Haunted Mansion, the recent Pirates of the Caribbean movie craze (with its supernatural plot themes) means that ride isn't immune either. 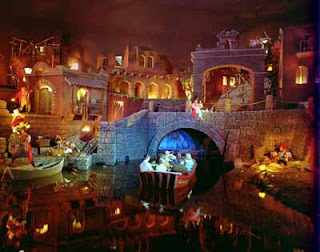 Just this past Friday a Cast Member watching the security cameras noticed a woman in the back of a boat throwing a powdery substance into the lavishly decorated sets in the cavern scenes near the beginning of the ride. Even though Pirates is a 15 minute long ride, by the time the lady spreading the substance returned to the loading area Security had yet to arrive. The college age Cast Members operating the attraction knew that legally they were not supposed to detain anyone, and when they confronted her about what she was doing in the cameras she told them she was only throwing baby powder around. The woman quickly disappeared out the exit, never to be seen again, but she'd actually left more than baby powder all over the Pirates of the Caribbean. Security and the police finally arrived, and the ride was shut down on a busy afternoon of a holiday weekend. The ash was identified by the Anaheim Police as cremated remains, and the custodial department found most of it all over the "Captain's Quarters" scene in the caverns. The woman had done a very thorough job of spreading the ash everywhere though, and after an hour of cleaning with the HEPA vacuums there was still work to be done. Because those lavish sets are maintained by costumers and maintenance crews that don't come in until Midnight, and with a growing crowd of cranky tourists outside wanting to know when Pirates would reopen, Disneyland management was faced with the decision of reopening the popular ride with ash remaining on the bedspreads, props and antiques in the caverns. While custodial did a thorough job of cleaning the ash from the rockwork and the areas closest to the passing boats, much of the cremated remains would have to stay there until the set could be dismantled and cleaned completely after the park closed for the night. So after a lengthy downtime, Pirates of the Caribbean was reopened by management with the remains of a very devoted fan still spread through much of the Captains Quarters. The growing phenomenon of cremated remains being spread inside Disneyland rides is obviously a tough situation for the park. It has trained its ride operators to try and respond as effectively as possible, and yet there's not much else they can legally do about it short of staffing a police officer at the Haunted Mansion every day. The example just this last weekend at Pirates of the Caribbean however shows that no ride is really immune. And many attractions at Disneyland still operate with no security cameras at all. The Matterhorn only has three grainy cameras that cover the lift up the mountain, with the rest of the bobsled run entirely unseen. If Uncle Bert was a big Matterhorn fan, he may have been sprinkled inside without anyone knowing. It's a Small World is another long, fifteen minute ride that doesn't have a single security camera anywhere. All sorts of illicit things happen inside Small World at the end of the night, and leaving Grandma's remains in there to listen to that catchy song for all eternity is definitely a possibility. Disneyland installed a security camera years ago inside the Snow White ride to catch people trying to steal the apple from the witch's hand, but there are still many popular attractions without any surveillance system where illegal dumping of human ashes is still an option. The residue is often found at the end of the night however, and most of the people who carry out a last request by spreading a loved one's remains at The Happiest Place On Earth likely don't know the less-than-reverential end they meet at the hands of the ultra-efficient Disneyland Custodial Department.